Chewing motions - Definitely yes. I caught him doing this many times already. As if he is eating! This also means that we get to shop for things that we need to prepare him for solid food. *Yay!!! * For Baby's bowl and sippy cups, I have been eyeing on the Tommee Tippee brand. I also learned that I am going to need a blender and steamer to prepare my Baby's food. 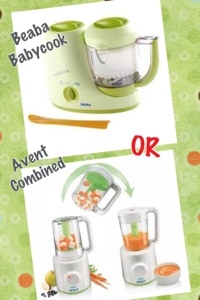 For these, I have not decided between Beaba Babycook or Avent combined Steamer and Blender. I'm still doing the pros and cons and so far, Avent is at the top. I might also need a freezer tray, in case I make a large batch of puree food. I'm not sure whether to buy Beaba or Tommee Tippee but I like TT because its an individual pots instead of a large tray. Hmm~ It's obvious isn't it? Pffftt! And so far, we have only been using bottle warmer, all 150ml bottles, occasionally using the thermal bags and bottle brush for washing. 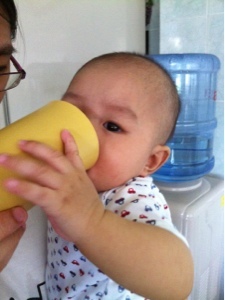 Baby Iqbal still drinks 70-100ml hence we're still using the small bottles. We tried giving EBM using Medela but he does not like it.